What is the size of the CubeShield? The CubeShield is 4 feet along each side and stands about 2.5 feet tall. What fabric is used for the CubeShield? How is the CubeShield attached to the cubicle? We provide self-adhesive Velcro to attach to the top of the cubicle wall. Yes, the CubeShield must sit in a corner with a 90 degree angle. Will the CubeShield work on a single wall. No, a corner is required. Which is better, the CubeShield or the CubeSlice? The CubeShield stands as a half pyramid. It has the benefit of allowing you to sit and stand normally. The CubeSlice acts as a low ceiling. You would need to pull the chair out before sitting or standing. Darker colors block more light than lighter colors. Most of our customers want to block as much light as possible, so they select black. Is a larger version of the CubeShield available? No. We have made the product as large as possible while still being within the national fire safety codes. Is a smaller version of the CubeShield available? No. Most of our customers have a problem with too much light and require that the product be as large as possible. Can I order a custom color for the CubeShield? We take suggestsion, but it takes 3 months and there is a minimum quantity that makes custom colors prohibitive. Can I order a custom log to be imprinted on the CubeShield? No. It is simply cost prohibitive to pay the silk screen setup costs. Instead, we recommend that you have Kinkos print your logo on self-adhesive paper. This approach is much more efficient and much more flexible. Is the CubeShield fire resistant? No. But if this is a requirement, you can obtain a flame retardant spray on Amazon. What national fire safety codes apply? In the US, we are only aware of two safety rules. The first is that the unit not be larger than 4 feet and the second is that the unit be at least 18 inches from the sprinkler. Other than those two rules, it is at the discretion of the local fire marshal. The unit collapses after a day. How do I make sure it stays up? The most common problem with a CubeShield collapsing is that it is not mounted tall enough. 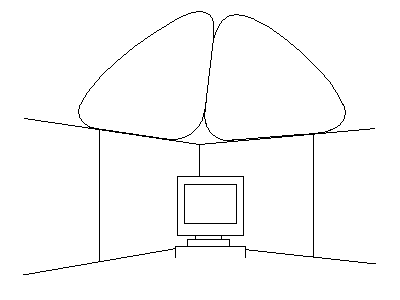 One way to gauge the proper height is to place the CubeShield in the corner of a room with the edges aligned with the corners between the walls and the floor. Also, the CubeShield should rest lightly on top. If you find that you are pulling the Velcro straps tight, then this could cause the glue to be pulled up. If the problem is that the Velcro has been pulled up, then you will likely need new Velcro. If UPS shipping costs more than USPS Priority Mail, does that mean it is faster? No. We use UPS Ground and we are located in North Carolina. When shipping to California, UPS Ground is typically 5 business days (roughly a week) where as USPS Priority Mail can be either 2-day or 3-day. Also, USPS will deliver on a Saturday, where as UPS Ground will not. Can the CubeShield be returned and exchanged for a different color? Yes. Just send it back with a note requesting a different color. What is the size of a single unit when shipped? A single unit collapes into a 16 x 16 x 1 package. How do I fold up a CubeShield?